The Crucial M500 SSD is a legacy product and is no longer available. See a current list of Crucial SSDs. New interfaces and multitasking demands require more from your system than perhaps ever before. From connecting instantly with friends and accessing apps, websites, and playlists online, to simultaneously streaming videos and downloading files, your computer is faced with an entirely new set of performance expectations that a hard drive struggles to meet. That's where the Crucial M500 SSD comes in. With data transfer speeds radically faster than a high-performance hard drive, the Crucial M500 SSD isn't just a storage upgrade — it's a complete system transformation. From its nearly instantaneous boot times, powerful data transfer speeds, increased multitasking capability, and rock-solid reliability, the Crucial M500 delivers dramatic performance gains — all at an affordable price. Ample storage capacity with plenty of choice. Available in capacities up to terabyte-class, the Crucial M500 SSD provides plenty of storage for your ever-growing collection of photos, videos, music, and important documents. Based on your storage needs, choose between a 120GB, 240GB, 480GB, or 960GB* drive and access your programs and files almost as soon as you click on them. If you prefer to store your data on an external backup drive, in the cloud, or on your home network, opt for a smaller capacity. Or if you'd rather have everything in one place, choose one of our larger sizes. Whichever capacity you choose, our selection ensures that you're able to find a drive that's the right combination of storage, performance, and price. 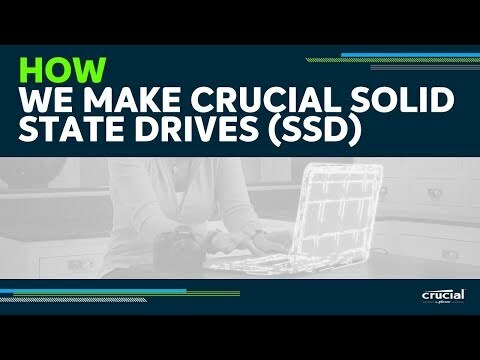 No matter what kind of files you're working with on a Crucial SSD, you'll experience high speeds with no drop in performance across different file types. Unlike other SSDs on the market, Crucial SSDs treat all files the same, regardless of whether they're compressed or uncompressed. While many SSDs on the market achieve faster speeds by using file compression, many of the most common file types can't be compressed, resulting in SSDs that often deliver slower speeds than advertised. This is important because the files most people use every day — videos, mp3s, advanced graphic files and zip files - are compressed files and thus unable to be compressed any further. With a Crucial SSD, the specs we advertise are the same specs you'll see in the real world. Crucial SSDs. Performance you can trust. Crucial is a brand of Micron, one of the largest NAND manufacturers in the world, and we design and develop our SSDs in-house using state-of-the-art technology. This means four things: hundreds of SSD qualification tests, over a thousand hours of prerelease validation testing, 1.5 billion dollars invested in R&D, and more than 30 years of industry expertise. With our multi-billion dollar commitment to NAND development, our record of patent and process innovation, and our award-winning customer support team, we're dedicated to quality. For you, that means your SSD has been designed with cutting-edge technology and it's been rigorously tested and approved. Don't settle for anything less. * 1 GB = 1 billion bytes. Actual usable capacity may vary. *** Performance measured using IOMeter (other names and brands may be claimed as the property of others.) with Queue Depth 32. Measurements are performed on 8GB of LB range on a full SSD.